My reply: My favourite is to thickly slice the sweet potato (the sweeter, white variety pictured above is my preference for this) and single layer them in a heavy baking dish. Strew generous sprigs of fresh rosemary, generously sprinkle with ample crackings of fresh pepper and salt, drizzle with extra-virgin olive oil, and then place a thick ring of sliced fresh lemon on each potato slice. Cover with foil and roast in the oven till the potatoes are tender, then remove the foil and keep roasting till the potatoes are golden and crisp. The lemon rings will scorch and should be removed before serving, but their lovely lemon oil will infuse the potatoes. Serve with the chutney below. You can also pop them in sambar to make a nice foil to the hot and sour taste. The brilliant corn chutney has become one of my favourites. 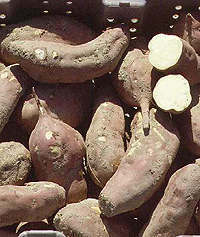 It marries perfectly with sweet potato, its South American partner from ages past. Best consumed the day it’s made. Serves 4. Process all the chutney ingredients in a food processor, pulsing on and off until the mixture is slightly chunky and loose textured. Add a little water if the mixture is too firm. Remove. Serve immediately with the sweet potato, or cover and refrigerate.